Molecular imaging has played an important role in the noninvasive exploration of multiple biological processes. Reporter gene imaging is a key part of molecular imaging. By combining with a reporter probe, a reporter protein can induce the accumulation of specific signals that are detectable by an imaging device to provide indirect information of reporter gene expression in living subjects. There are many types of reporter genes and each corresponding imaging technique has its own advantages and drawbacks. Fused reporter genes or single reporter genes with products detectable by multiple imaging modalities can compensate for the disadvantages and potentiate the advantages of each modality. Reporter gene multimodality imaging could be applied to trace implanted cells, monitor gene therapy, assess endogenous molecular events, screen drugs, etc. Although several types of multimodality imaging apparatus and multimodality reporter genes are available, more sophisticated detectors and multimodality reporter gene systems are needed. Molecular imaging is a rapidly developing discipline combining molecular biology and medical imaging techniques [1-7]. Over the last decade, advances in cell biology and molecular biology have led to an enhancement of our understanding of cancer  and cell behavior , and have stimulated progress in gene therapy . Molecular imaging uses this information to allow the visualization of biological processes, as well as diagnosing and managing diseases [1, 10]. Compared with traditional in vitro tissue culture and in vivo animal studies, “molecular imaging is the visualization, characterization and measurement of biological processes at the molecular and cellular levels in humans and other living systems” [2, 11]. It allows longitudinal, noninvasive, quantitative, and repetitive imaging of targeted biological processes at both the molecular and anatomic levels [7, 12]. Remarkable advances have been made in molecular imaging by integration of many fields, such as biology, chemistry, physics, engineering, pharmacology, and medicine . 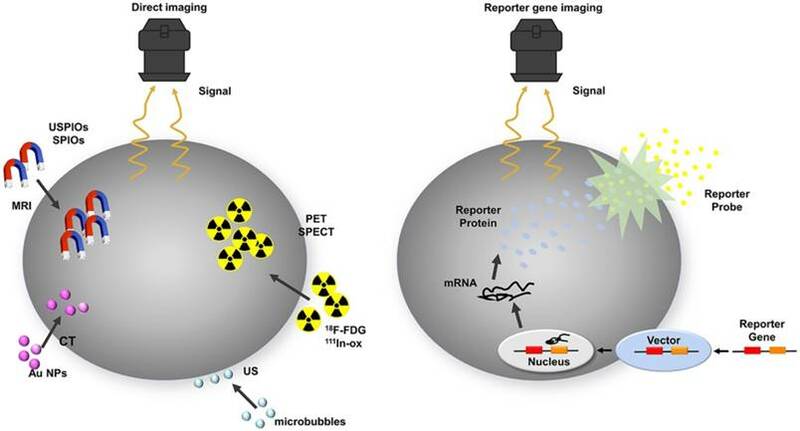 Molecular imaging allows numerous applications, such as monitoring of endogenous transcriptional regulation, analysis of gene transfer, tracking of tumor cell survival, screening for transgenic animal phenotypes, earlier detection and characterization of disease, evaluation of treatment, and expedition of drug discovery (Figure 1) [14, 15]. So far, molecular imaging techniques have usually been divided into two main categories, direct imaging, or the reporter gene-based technique. The former employs contrast agents, such as luminescent dyes, radioactive tracers, or magnetic particles, whereas the latter depends on the expression of a receptor, protein, or enzyme after the temporary or permanent transfection of cells [7, 16, 17]. The term “reporter gene” is used to describe a gene whose expression product is easily identified and satisfies the following characteristics: it has been cloned and the whole sequence has been determined, and the expression product does not exist in the recipient cells or its amount is insufficient for detection by imaging modalities [18-20], and can be quantified [21, 22]. In living subjects the expression of a reporter gene can be indirectly reflected when the reporter protein combines with the corresponding probe and causes the accumulation of a specific imaging signal , detected by an imaging device . “Constitutive” reporter genes allow monitoring of gene activity; “inducible” expression is tied to the level of endogenous promoters and transcription factors [7, 9]. Schematic diagram of molecular imaging techniques, including nuclear modalities such as positron emission tomography (PET) [23, 24] (Adapted with permission from , copyright 2017 ACS Publications) (Adapted with permission from , copyright 2017 Wolters Kluwer Health) and single photon emission computed tomography (SPECT)  (Adapted with permission from , copyright 2016 Elsevier), magnetic resonance imaging (MRI)  (Adapted with permission from , copyright 2013 Nature Publishing Group), optical imaging (OI) such as bioluminescence imaging (BLI)  and fluorescence imaging (FLI)  (Adapted with permission from , copyright 2014 Public Library of Science), photoacoustic imaging (PAI)  (Adapted with permission from , copyright 2013 Nature Publishing Group), and Cerenkov luminescence imaging (CLI)  (Adapted with permission from , copyright 2014 American Association for Cancer Research). In the past decades, with the development of biotechnology and imaging technology, reporter gene imaging has also been flourishing. Multimodality imaging technology has also been applied in the reporter gene imaging. Reporter gene multimodality imaging strategy could be applied to trace implanted cell, monitor gene therapy, assess endogenous molecular events and scree drugs, which shows more and more important prospects. The aim of this review is to summarize the construction methods and applications of the multimodality reporter gene, and look forward to the future progress. In terms of direct imaging strategies, the chief advantage of direct cell labeling is that it needs very little cell manipulation. Although direct labeling is commonly used owing to its straightforward operation and providing strong imaging signal, the accuracy of the imaging signal produced by exogenous contrast agents might be compromised due to the contrast agents dilution with each cellular division or phagocytosis by macrophages, leading to the signal fading over time . Both viable and dead cells emit signals [20, 30, 31], leading to uncertainty about cell viability [32, 33]. Exogenous contrast agents are not specifically targeted to certain cells. Side effects, including renal toxicity and allergic reactions, may arise when using these agents [34, 35]. From this perspective, genetic techniques are superior because the reporter gene is inserted directly into the cell's DNA, thus ensuring that the reporter gene transcription and translation occur only in living cells  and will be passed on to the daughter cells equally [7, 37, 38]. However, during reporter gene imaging, transplanted cells often undergo further spontaneous genetic modification, posing potential safety issues, such as oncogenesis or an immune response [7, 39]. This raises safety issues. Although reporter gene imaging may cause extra risks for mutagenesis, it is still the predominant strategy owing to its accuracy of signal detection from living cells (Table 1 and Figure 2) . 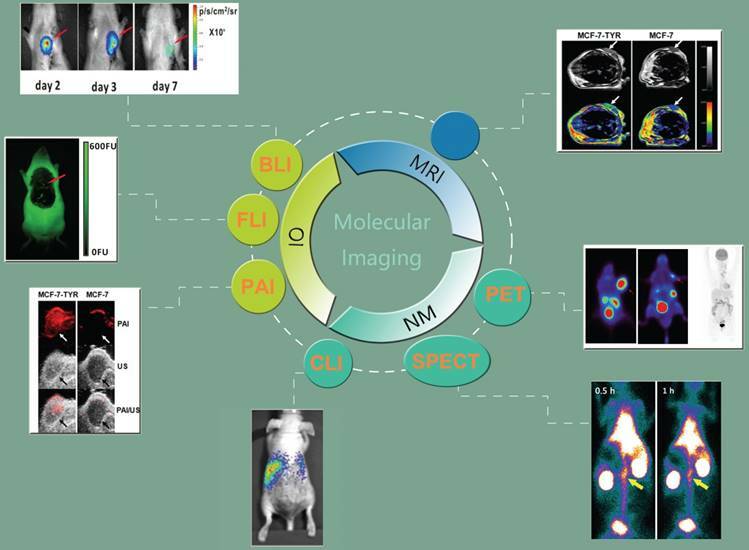 Schematic of common approaches for molecular imaging in vivo. For direct labeling (left), imaging probes may enter the cell via endocytosis (i.e., SPIOs, USPIOs and Au NPs), transporter uptake (i.e., 18F-FDG), or passive diffusion (i.e., 111In-ox) and may bind to the cell surface through antigen - antibody or ligand - receptor recognition (i.e., microbubbles). Labeled cells are then detected by imaging systems such as PET, SPECT, MRI, CT, and ultrasound. In reporter gene imaging (right), genetic modification of cells utilizes reporter gene integration. Target cells are transduced or transfected with a multimodality reporter gene construct. Transcription of the reporter gene under the control of a promoter is followed by translation of its mRNA, leading to accumulation of reporter proteins such as enzymes (i.e., HSV1-tk, RLuc, FLuc, and eGFP), receptors (i.e., D2R), and transporter proteins (i.e., hNIS). Abbreviations: Au NP: Au nanoparticle; CT: computed tomography; D2R: dopamine D2 receptor; eGFP: enhanced green fluorescent protein; 18F-FDG: 18F-fluorodeoxyglucose; Fluc: firefly luciferase; hNIS: human sodium-iodine symporters. HSV1-tk: herpes simplex virus type-1; RLuc: Renilla luciferase; SPIO: superparamagnetic iron oxide; USPIO: ultrasmall superparamagnetic iron oxide. The reporter gene strategy is most commonly used in modern molecular imaging, namely, combining a reporter gene with the corresponding reporter probe . So far, an assortment of molecular imaging modalities, including the different kinds of optical imaging (OI) such as fluorescence imaging (FLI), bioluminescence imaging (BLI), photoacoustic imaging (PAI), and Cerenkov luminescence imaging (CLI); positron emission tomography (PET); single photon emission computed tomography (SPECT); and magnetic resonance imaging (MRI) can all be used for reporter gene imaging [26, 40-42]. Comparison of molecular imaging strategies. Strategy Physical Contrast agents 1. Relatively simple and direct operation. 2. Minimal cell manipulation, no mutation. 3. A variety of targets 1. Different aims need different probes. 2. Specific probe should be made for a special target. 3. Limited binding sites, receptor affinity. Strategy Genetic Gene 1. Only exist in viable cells. 2. Reliable and accurate data. 3. Monitoring gene expression changes. 1. More complex in design and operation. Presently, green fluorescent protein (GFP), enhanced green fluorescent protein (eGFP), red fluorescent protein (RFP), and the latest near-infrared fluorescent proteins are the most commonly used reporters in FLI [45, 46]. BLI employs luciferases such as those of the American firefly Photinus pyralis, the sea pansy Renilla reniformis, or the marine copepod Gaussia princeps, as reporters [47, 48]. The herpes simplex virus type-1(HSV1-tk) and its mutant HSV1-sr39tk from thymidine kinase (TK) are enzyme-based reporter genes for PET imaging with 124I-FIAU (2-fluoro-2-deoxy-1-β-D-arabinofuranosyl-5-iodouracil) or 18F-FHBG (9-(4-18F-Fluoro-3-[hydroxymethyl]butyl)guanine) . Human ferritin heavy chain (hFTH) is a novel gene reporter in magnetic resonance imaging . The overexpression of transferrin receptors (TfR) induces a significant reduction in T2-weighted signal intensity on MRI . Sodium-iodine symporters (NIS) can effectively accumulate 99mTc, 123I ,131I or 124I in cells for SPECT or PET imaging, respectively . All of these imaging techniques and reporter genes have their own advantages and disadvantages, making them more suitable for different applications [41, 53, 54]. For example, radionuclide-based imaging techniques, such as PET and SPECT, have the advantage of high sensitivity, providing quantitative and tomographic information that may be used in a clinical setting. However, their shortcomings are relatively poor spatial resolution, cost, and radiation exposure [55, 56]. OI using BLI or FLI is suitable for in vitro studies and frequent small animal imaging . It offers great sensitivity (10-15 M for bioluminescence)  at a lower cost and higher throughput. It also possesses the ability to exploit differential spectral properties of molecular probes for multichannel imaging [58-60], but the energies in the visible to near-infrared region of the spectrum are limited due to the intrinsic absorption and light scattering of heterogeneous tissues [61, 62], which has become a major obstacle to its clinical application . Optical signals have lower spatial resolution , and are not suitable for large imaging areas or tomography . These weaknesses limit the application of OI for intraoperative use, making it difficult to translate animal studies into clinical studies [64, 65]. MRI has a high degree of spatial resolution [57, 66] with superb soft tissue contrast , a lack of ionizing radiation  and can image deep tissue , which makes preclinical findings easily translated to the clinic . However, it is handicapped by its inherently low sensitivity compared with OI and nuclear imaging [40, 68, 69]. CLI is based on Cerenkov radiation, which is generated when a charged particle (positron or electron) traverses through a dielectric medium at a velocity greater than the phase velocity of light in the medium [70, 71]. The most dramatic characteristic of CLI is combining the advantages of optical and nuclear imaging, and the availability of many PET radiopharmaceuticals already approved by the US Food and Drug Administration may push the rapid translation of CLI into clinical practice . PAI is a hybrid optical imaging method that detects acoustic responses in tissue by generating a transient rise in local temperature [73-75]. It is capable of producing 3D imaging in vivo with high spatial resolution and contrast. Moreover, it allows mapping of deeper tissues (approximately 5 cm) beyond the optical diffusion limit [73, 76, 77]. The ideal imaging platform should have the following characteristics, such as safety and biocompatibility. It ideally could be used for quantification of cell number and undergo no dilution with cell proliferation . All the above-described single-mode imaging techniques have their own unique applications, advantages, and limitations . Modalities with high sensitivity tend to have lower resolution (e.g., OI and nuclear imaging), while those with high resolution have limitations in sensitivity (e.g., MRI) [79, 80]. Hence at present no imaging modality combines all these advantages, and no one imaging modality is better than the others . An imaginative strategy, combining cellular-level and whole-organism-level imaging, via fusing different reporter genes detectable by different imaging modalities, so-called “multimodality reporter gene imaging” is one solution [82, 83]. Multimodality reporter gene imaging has the potential to harness the advantages of each modality [84-86]. For generating a multimodality reporter gene system, several strategies are available for the linkage of multiple exogenous genes. There are five frequently used strategies (Figure 3). First is the use of a fusion gene vector, whereby multiple genes are linked and located downstream from a common promoter to form a single reading frame. In this case, their coding sequence will generate a single fusion protein. Second is the bicistronic strategy, which has been the most widely used. An internal ribosome entry site (IRES) element is inserted between two gene sequences, with the two connected reporter genes both under the control of a single promoter to create an “expression cassette.” This expression cassette gives rise to two different mRNAs that translate into two different proteins. The bicistronic strategy has been reported to give rise to unbalanced expression levels of the two genes; the expression of the IRES downstream gene is often lower than that of the upstream gene. A third approach is to make two exogenous genes into two vectors, which are co-transfected into the same cells. The shortcoming of this strategy is relatively low and uncontrollable transfection efficiency. Fourth, multiple reporter genes can be constructed into a single vector, but each gene is controlled by its own promoter and expresses its corresponding protein independently. This may be the best method. A fifth strategy uses bidirectional transcription. A promoter locates centrally in the vector, and is surrounded with two reporter genes, which makes it possible for co-expression of two different products in a bidirectional manner [13, 87-97]. Schematic of promoter-reporter gene constructs strategies. P1 and P2 represent promoter/enhancer sequences; Gene1 and Gene2 are reporter genes; IRES is internal ribosomal entry site. Although reporter gene imaging has been extensively studied in vivo, a critical issue in these molecular imaging strategies is to choose a safe transduction pathway to transfer exogenous genes into the cells of interest . The expressed genes, targeted cell types, the phase of transfection and expression vectors are all the factors that affect the infection efficacy. In terms of transfection vectors, viral infection method is the most effective. Vande Velde G et al. showed that adeno-associated viral vectors system seemed to be the most promising vector system for in vivo MRI reporter gene imaging for its low background signal interference and high transgene expression levels . Wu et al. transiently transduced a single reporter gene into embryonic rat H9c2 cardiomyoblasts with E1-deleted adenovirus . Although the E1 region was deleted, there still was a host immune response against the transduced H9c2 cells expressing small amounts of immunogenic adenoviral proteins . Because the adenoviral transduction approach cannot integrate the exogenous gene into the chromatin of recipient cells, the expression of reporter protein will decrease with cell division and proliferation, which makes it difficult to track cell survival and proliferation over time . Retroviral-mediated gene transfer is an efficient method for inserting transgenes into actively dividing primary cells . Recent data suggest that a retrovirus transfection system can accomplish the integration of foreign DNA into the chromosome of the host cell, which may simplify monitoring of cell proliferation, although it is accompanied by an increased risk of mutagenesis . However, retroviruses are incapable of integrating a transgene into non-dividing cells . They also suffer from the phenomenon of silencing by DNA methylation and histone deacetylation during extended cell division . Lentivirus, on the other hand, possesses the unique ability to insert a transgene into the cell chromatin with minimal cytotoxicity, infect cells in the stationary phase as well as the mitotic phase, and is not vulnerable to gene silencing [107-110]. The use of self-inactivating long terminal repeats (LTRs) in the lentivirus allows incorporation of the internal promoters into the transfer vector. Thus, the reporter genes can be expressed in a tissue- or lineage-specific manner, or in an inducible system [111, 112]. Also, the virus glycoprotein pseudotyped lentivirus can be concentrated to achieve a high titer that is several orders of magnitude greater than the retrovirus. Titers as high as 109 transducing units/mL (TU/mL) have been reported . Compared with all of the above vectors, baculovirus has recently caught researchers' attention as a multipurpose and robust vector system for protein production, development of vaccines, in vitro and in vivo gene delivery, drug development, and cancer treatment [113-115]. Baculovirus can transduce mammalian cells efficiently with minimal cytotoxicity. Although it possesses some distinct advantages, it is still incapable of replicating in mammalian cells, so the viral genome gradually dilutes with cell division. In recent years, baculoviruses with steady transgene expression have been developed, which may optimize this vector system for use in long-term monitoring of cell behavior [116, 117]. This novel vector can also infect dividing and nondividing cells and boasts a large packaging capacity of > 100 kb . As it never randomly integrates into the host genome, unwanted mutations can be avoided [119, 120]. Furthermore, recombinant baculovirus can be easily constructed and achieves high titers . Although viral-mediated methods are widespread in the application of reporter gene transduction, the possibility of uninhibited infection and stochastic genomic insertion of exogenous reporter genes limits their clinical application . In contrast, in clinical practice, non-viral gene delivery is more acceptable due to the use of some biocompatible materials, and its safety is easily assessed by pharmacokinetic and pharmacodynamics studies . The piggyBac transposon system, a non-viral gene-delivery arrangement, permits a “cut and paste”-mediated transposition of exogenous genes into the genome at “TTAA” sequences . It features mammalian compatibility, large cargo capacity with higher transposase activity, and stable reporter gene expression. It can integrate multiple transposons simultaneously, and it can maintain the DNA sequence when removed from the integration site. Compared with Sleeping Beauty, which presents a significant reduction in efficiency with larger transgenes, piggyBac is able to deliver large (9.1-14.3 kb) transposable elements without significant loss of transposition efficiency [124, 125]. It requires an auxiliary plasmid that encodes the piggyBac transposase gene to facilitate the transposition of exogenous genes . Though its application has been less frequently reported in multimodality reporter gene imaging, its advantages still make it a great tool for potential therapeutic and biological applications such as cancer research, induced pluripotent stem cells, and immunotherapy without using viral vectors [127, 128]. As described before, joining two or more reporter genes together with short linkers under control of a single promoter is a useful approach for the multimodality reporter gene technique . Studies have shown that the maintenance of each protein's function is strongly related to the length of the linker amino acid (aa) sequence , as sometimes one or more reporter proteins may lose enzymatic activity when fused together . Ray et al. were the first to build an optical-PET fusion reporter and demonstrated its validity in cell culture and tumor-xenograft-bearing mice with bioluminescence and microPET imaging. They explored three linkers (10 aa, 18 aa, and 20 aa) with different lengths and compositions, and found that the 20 aa linker was optimal to maintain sufficient activities for both reporters. In addition, with the positive control (pCDNA3.1-HSV1-sr39tk) as a reference, each group of all the fusion constructs showed decreased TK enzyme activity and the shorter length of the linker indicated the lower TK activity. In addition, the RL activity of each construct was relatively higher (approximately 6-8 fold) in comparison to the positive control (pCDNA3.1-rl) and its activity correlated positively with spacer length . Due to the functional importance of the position of crucial amino acids in the protein backbones, the order of the fusion genetic construct is a crucial factor in maintaining the activities of each protein. Studies have demonstrated that even a few changes in several critical amino acids at the COOH-terminal end of HSV1-tk will render TK protein vulnerable to loss of activity [132, 133], indicating that caution with the COOH terminus in the fusion process is necessary. The tk20rl fusion gene constructed with partial loss of TK activity might be improved by inserting a longer linker between the two genes or positioning TK as the downstream gene . Advances in multimodality reporter gene imaging strategies have been important for exploring biological processes. Typically, there are two imaging strategies. One is the reporter gene strategy, which is based on using a stand-alone reporter gene or combining two or more reporter genes together to serve as multimodality reporters. The other is a combined labeling strategy, involving reporter genes (e.g., luciferase and eGFP) and physical labeling with contrast agents (e.g., micron-sized particles of iron oxide (MPIO) and superparamagnetic iron oxide (SPIO)) together (Figure 4). The former can objectively provide accurate data on cell viability or engraftment since the reporter signal will only be produced by viable cells. PET reporter gene substrates (e.g., 18F-FHBG) cannot cross the intact blood-brain barrier. However, the MRI agents make up for this shortcoming..
A widespread strategy is to form a recombinant DNA construct (e.g., HSV-tk1-eGFP-Fluc) by assembling several reporter genes together, allowing the expression product to be detected by multiple imaging instruments [89, 135-138]. To ensure authenticity, the expression of each component of the recombinant gene should be consistent with its independent reporting genes; also, the recombinant construct should be stable . However, after combining different reporter genes, the protein expression of one or more genes may decrease because of some reasons, such as the steric hindrance [57, 140]. Multimodality reporter gene imaging strategies. (A) Reporter gene strategy: Expression of the enhanced green fluorescent protein reporter gene (eGFP) leads to cytosolic retention of enhanced green fluorescent protein (EGFP), which emits fluorescent light (green λ) when excited with a light source (blue λ). Transcription of the firefly luciferase gene (fLuc), followed by its translation, leading to accumulation of firefly luciferase enzyme (FLuc) that catalyzes a photochemical reaction when its substrate D-luciferin is present. The resultant fluorescent light (brown λ) emission can be detected by a charge-coupled device camera. Furthermore, the human sodium iodide symporter (hNIS) transporter is able to transport radioactive forms of iodide, as well as other anions such as technetium pertechnetate (99mTcO4-); then the decay of the radionuclide is detected using SPECT. (B) Reporter gene and contrast agents combination strategy: Cells are genetically modified with the reporter gene(s) and labeled with imaging probes. The dopamine 2 receptor (D2R) gene complex is transfected into target cells by a vector. Inside the transfected cell, the D2R gene is transcribed to D2R mRNA and then translated to a protein (receptor). After introduction of radiolabeled probes (i.e., 18F-FESP) and recognition of the receptors, the radiolabeled substrate is trapped within the cells. The accumulation of the probe gives rise to a radioactive signal. Also, the target cells are incubated with SPIO particles that are taken up by nonspecific endocytosis. Protons surrounding each SPIO emit a radiofrequency pulse after excitation that is detected by MRI. Abbreviations: 18F-FESP: 3-(2′-[18F]-fluoroethyl)-spiperone; I: iodine; RF: radio frequency; SPIONs: superparamagnetic iron oxide nanoparticles; 99mTcO4-: technetium pertechnetate. OI and nuclear medicine imaging (NMI) Combining these two technologies with a single vector would bring each modality's superiority into full play at the small animal level and in turn has the potential to translate the application to humans . PET/BLI seems to be the most sensible combination. PET allows tomographic and three-dimensional imaging and quantitative analysis, In addition, BLI can easily and economically produce bi-dimensional images with high sensitivity . Also, the combination of fluorescent protein with NM reporter genes allows quantitative assessment of reporter gene expression at the macroscopic and microscopic levels . Tian et al. established a transgenic mouse model using a knock-in gene targeting approach with a fused reporter gene structure for exploring acute liver injury and diethylnitrosamine-induced hepatocellular carcinoma (HCC). In this multimodality reporter gene system, Fluc and HSV1-tk were controlled by the mouse alpha fetoprotein promoter (Figure 5A). Alpha fetoprotein gene expression is highly specific in certain pathological conditions such as acute liver injury and liver tumors such as HCC. The authors successfully demonstrated that the expression of these two reporter markers could be detected in the injured hepatocytes and induced HCC tumors with BLI and PET (Figure 5B-C). The combination of this model with currently available tracers offers a potential new means for monitoring liver injury . Lin et al. transduced a fusion reporter gene (eGFP-tk) into a breast tumor model in ZR75-1 cells, which allowed noninvasive imaging of tumor growth using fluorescence and nuclear imaging platforms (Figure 5D, F). The green fluorescence emitted by the tumor model bearing eGFP-tk was measured and found to be 15-fold higher than that by the wild-type tumor. In addition to imaging, HSV1-tk can be also treated as a therapeutic gene. By using ganciclovir (GCV), HSV1-tk showed therapeutic potential in treating tumors; decreased 123I-FIAU uptake in eGFP-tk tumor by GCV treatment as well as significant decrease in eGFP-tk tumor volume have been proven (Figure 5E). 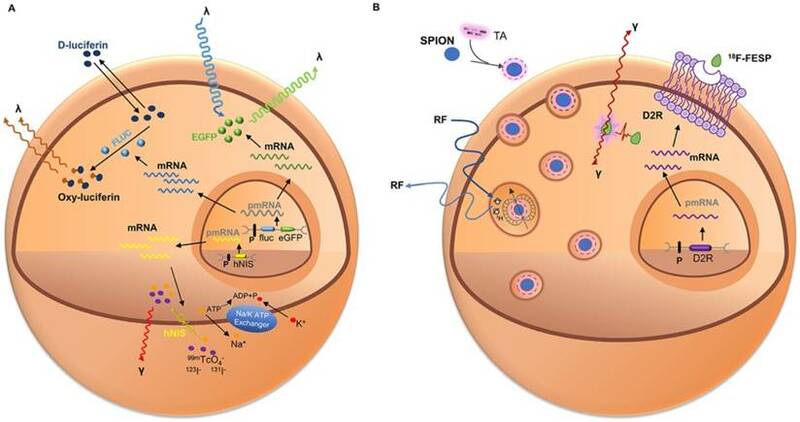 In this report, the feasibility of eGFP and HSV1-tk expressed in breast tumor cell lines to achieve the goal of treating tumor and monitoring tumor growth or therapeutic effects in vivo simultaneously was demonstrated. However, the application of HSV1-tk as a PET marker within the central nervous system is limited by the fact that marker/reporter probes for this system do not significantly penetrate the blood-brain barrier (BBB) . Waerzeggers et al. demonstrated that to be able to detect C17.2 cells within the brain by specific accumulation of 18F-FHBG, these cells have to be localized in regions where the BBB is disrupted . To overcome the problem of limited BBB penetration, several research groups have explored methods to improve the transport rates of these marker/reporter probes across the BBB, for example, by creating new radiolabeled HSVl-tk substrates with increased lipophilicity, which facilitates passive diffusion of the radiotracer across the BBB , or by creating new reporter gene/reporter substrate systems, such as the xanthine phosphoribosyl transferase reporter enzyme. The feasibility, sensitivity, and specificity of this system have already been successfully tested in an intracranial glioma modal with almost intact BBB using 14C-xanthine and quantitative autoradiography . Oncolytic viruses have shown great promise in the treatment of cancer. Therefore, noninvasive imaging modalities are needed to monitor therapeutic effect and assess potential toxicity. Haddad D et al. modified GLV-1h68 to prepare GLV-1h153, in which hNIS gene and GFP gene were encoded. A time-dependent enhanced uptake of 131I was demonstrated in GLV-1h153 infected human pancreatic carcinoma cells PANC-1. 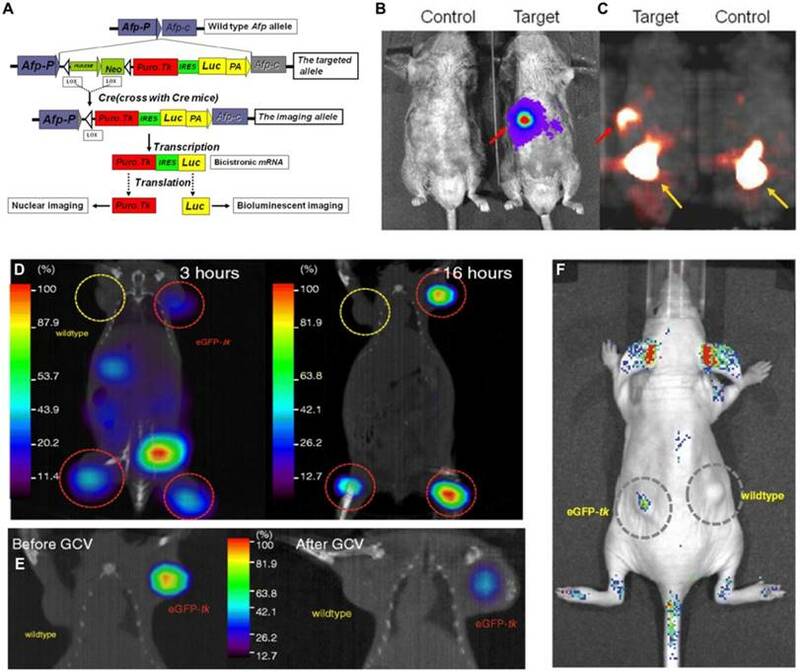 Viral mediated PANC-1 subcutaneous xenografts uptake was detected and easily visualized via 99mTc-scintigraphy and 124I-PET. These findings indicated that GLV-1h153 is a promising agent for the noninvasive imaging of virotherapy and deserves further investigation of long-term monitoring of virotherapy and potential radionuclide-based integrated approach of diagnosis and treatment. FLI and BLI Stem cell therapy is an exciting area of research. To investigate the differentiation, survival, and function of embryonic stem cell-derived endothelial cells (ESC-ECs) for ischemic heart disease, Li et al. used a dual-fused reporter gene consisting of Fluc-mRFP to track transplanted ESC-ECs. VE-cadherin (late EC marker) and eGFP double-positive cells (ES cells electroporated with pVE-eGFP-IE plasmid) were isolated using fluorescence-activated cell sorting. Bioluminescence imaging was performed for 8 weeks to assess the engraftment of ESC-ECs; cell signal was most robust immediately after transplantation. A drastic decrease in cell signal activity was observed over time, indicating significant donor cell loss. Although relatively few cells survived, the ESC-EC group had significantly higher fractional shortening compared with the control group and enhanced neo-angiogenesis at the 8th week after left anterior descending artery ligation . Murine macrophage Raw264.7 cells transduced with enhanced firefly luciferase (Raw/effluc) and murine colon cancer CT26 cells co-expressing Rluc and mCherry (CT26/Rluc-mCherry, CT26/RM) were established in a study  that successfully imaged the migration of tumor-associated macrophages to tumors and demonstrated significantly higher tumor growth rates in the CT26/RM+Raw/effluc group, suggesting tumor-associated macrophages can be an important module in the tumor microenvironment. After intraperitoneally transferring dexamethasone (DEX), effective blockade of Raw/effluc migration followed by almost complete suppression of tumor growth in the DEX-treated group was confirmed. In another study, BLI was used to track the survival and homing capacity of dual-reporter gene (eGFP/Luciferase)-expressing bone marrow-derived stromal cells in a peripheral tissue ischemia mouse model in the presence and absence of cyclosporine A immunosuppression. The cells were followed for 2 weeks in vivo using BLI. The signal appeared to be stable throughout the first week but then displayed a rapid and steep drop in bone marrow-derived stromal cell number and density during the second week. Massive pulmonary infarction, which led to respiretory failure and death, was the consequence of central venous injection of bone marrow-derived stromal cells, but intra-arterial injection proved to be a feasible and safe strategy to bypass the pulmonary circulation. Allogeneic bone marrow-derived stromal cells transplant survival was limited in an immune-competent host and cyclosporine A immunosuppression alone was not able to sustain long-term survival of the allograft, even at high doses. All above the findings were monitored with by BLI . OI and MRI Kim et al. developed a bimodal lentiviral vector to monitor deep tissue events using MRI by myc-tagged human ferritin heavy chain (myc-hFTH) expression and FLI by GFP expression (Figure 6A). MCF-7 and F-98 cells were stably transfected with the transgene construct (Figure 6B, D) and then were transplanted by subcutaneous injection into mice or rats. No differences in cell viability and growth owing to the overexpression of exogenous reporter genes were observed in MTT and trypan blue exclusion assays. 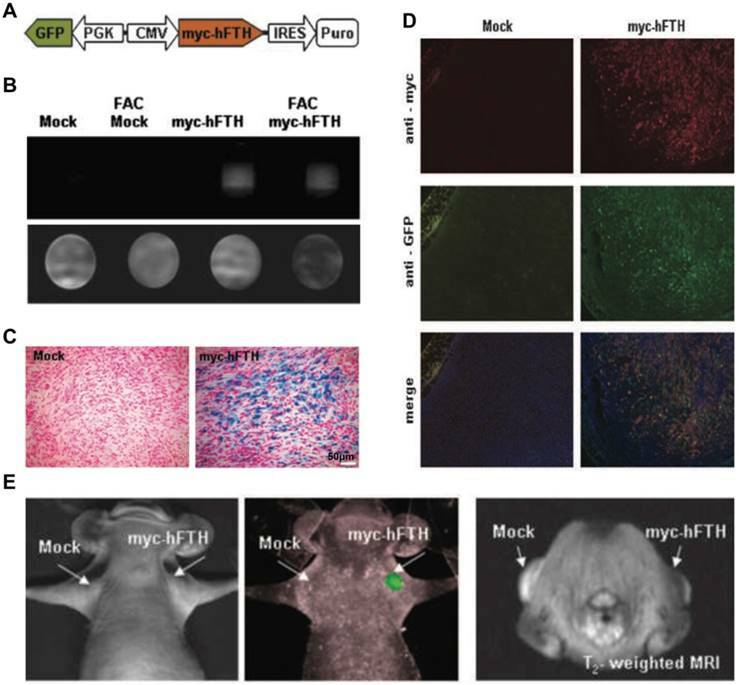 Compared with mock-transfected controls, iron accumulation was demonstrated in myc-hFTH cells and tumors, as well as significantly shorter relaxation times on T2-weighted MRI (Figure 6B-C), thus directly confirming that myc-hFTH expression can be visualized noninvasively with a 1.5 T clinical MR scanner. MRI and optical imaging with the fusion reporter genes can provide an extra level of quantitative and high-resolution information about biological processes, such as tumor growth, metastasis, and regression and gene-based therapy occurring in deep tissues  (Figure 6E). Rossi et al. constructed a lentiviral vector combining OI and MRI together, then successfully monitored the specific biological pathway activity (Wnt pathway) in glioblastoma cells responding to LiCl treatment. After LiCl administration, the luminescence signal increased significantly and lower T2 values were observed. This multi-reporter system introduced a new way to monitor the effect of a specific treatment for tumors. By synthesizing complementary information and then offering synergistic advantages over any modality alone, this system has the potential to be extended to other pathways and other diseases. NMI and MR spectroscopy Gene-directed enzyme prodrug therapy has shown promise in clinical practice. Xing et al. designed a triple-suicide-gene (TK, cytosine deaminase [CD] and uracil phosphoribosyltransferase [UPRT]). As an effector, TK converts the prodrug GCV into toxic products. Similarly, CD and UPRT function as effector genes, with CD converting the prodrug 5-fluorocytosine (5-FC) to the chemotherapeutic drug 5-fluorouracil (5-FU) and UPRT converting 5-FU to cytotoxic compounds (fluoronucleotides). All three genes function simultaneously as effectors for gene-directed enzyme prodrug therapy and markers for multimodality molecular imaging using PET and magnetic resonance spectroscopy (Figure 7A-B). The expression of TK and CD both in the TKCD and TKCDUPRT cells enhances the cellular sensitivity to GCV and 5-FC relative to that of the parental cells. Correspondingly, the existing UPRT in the TKCDUPRT cells enhanced their drug sensitivity to 5-FU and 5-FC compared with that of the TKCD cells. This preclinical study demonstrated that the concomitant expression of these genes significantly enhances prodrug radiosensitivity and cytotoxicity in vitro and in vivo (Figure 7C-F). This triple-suicide-gene approach improves the therapeutic efficacy compared with previous methods, and that multimodality molecular imaging can be used to monitor the delivery and evaluate the distribution and function/activity of the triple-suicide-gene. FLI, BLI and NMI Since adult cardiomyocytes have little capacity for self-regeneration , a method of transplanting stem cells to regenerate heart tissue and enhance cardiac function is under investigation in myocardial infarction patients . Our group  explored multimodality molecular imaging to monitor transplanted bone marrow-derived stem cells with a triple-fused reporter gene [TGF; HSV1-tk, eGFP, and Fluc] in acute MI rat models. In the heart, high signal was observed in infarcted rats injected with Ad5-TGF-transfected bone marrow-derived stem cells, whereas no signals were detected in the negative controls (Figure 8A). The heart/lung ratio of 18F-FHBG uptake of the experimental group was 31-fold higher than that of the control group (p = 0.043). It is interesting to note that all three imaging techniques in this study of the semi-quantitative analysis of TGF expression showed the same trend with gradual decrease of signals with time (Figure 8B-D). 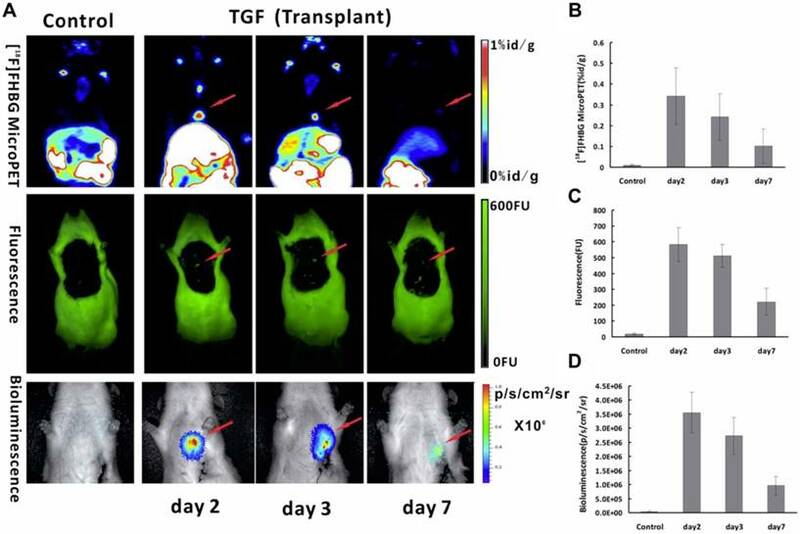 This study suggests that TGF reporter gene imaging may provide a practical multipurpose approach for in vivo monitoring of transplanted stem cells for the treatment of ischemic heart disease. By using tri-modal reporter imaging, another team  monitored bone marrow-derived dendritic cells' (BMDCs) migration and demonstrated a noticeable tumor protection phenomenon in the group immunized with BMDCs induced by mouse cervical cancer cell line TC-1 cells with no adverse effects. These findings provide a possible platform to image the location, migration, and antitumor immune responses of BMDCs. BLI, NMI and CLI Wolfs et al. optimized a lentiviral vector carrying dual-reporter genes, Fluc and hNIS, transducing in murine MSCs. When healthy C57BL/6 mice were injected in the tail vein with varying numbers of cells carrying the vector, the in vivo imaging information captured by BLI or small animal PET offered proof-of-principle for cell visualization. The injected amounts of cells correlated significantly with total photon flux. In addition, the Cerenkov signal obtained by 124I accumulation was monitored over 8 days in the xenograft expressing Fluc-hNIS. The results of this study indicated that hNIS is an appropriate tool for PET and CLI reporter gene imaging, and that CLI has the potential to form a translational bridge between the information acquired from nuclear and optical imaging. Some of single reporter genes can also be used in multimodality imaging. The single reporter gene system is more simple, stable, and convenient than the fused reporter gene, which requires complicated construction and verification [57, 157, 158]. NMI and MRI A variety of imageable small molecules can be transported across the plasma membrane by Oatp1. It also serves as a reporter gene by transferring MRI contrast agent (e.g., gadolinium ethoxybenzyl-DTPA [Gd-EOB-DTPA]) to produce a reversible, intense, and positive contrast in T1-weighted MR imaging [159, 160]. The oatp1-based reporters have a wide range of applications in tracking implanted stem cells and monitoring expression of gene therapy vectors with maximum signal enhancement. The Gd3+-based contrast agent has the ability to be detected with MRI. And SPECT imaging can be achieved by exchanging Gd3+ for 111In . Photoacoustic imaging (PAI), MRI and NMI Tyrosinase (TYR) is the key enzyme in melanin production . Melanin production is induced by introducing the TYR gene into non-melanin-expressing tissues (Figure 9A) [26, 162]. Melanin is an outstanding contrast that can be imaged with three different modalities including PET, MRI, and PAI (Figure 9A). PET imaging can be achieved with benzamide and its analogues such as N-[2-(diethylamino) ethy1]-6-18F-fluoropicolinamide (18F-MEL050) or N-(2-(diethylamino)ethyl)-18F-5-fluoropicolinamide (18F-P3BZA) [75, 163]. Because of its affinity for metal ions, MRI T1-weighted images are possible . Melanin's significant absorption at near-infrared wavelengths enables its use in PAI [165-167]. Our group first explored TYR as a stand-alone reporter gene for in vitro and in vivo PAI/MRI/PET imaging . In this study, MCF-7 human breast cancer cells transfected with a plasmid that encodes TYR (named MCF-7-TYR), B16F10 (a mouse melanoma cell line), and non-transfected MCF-7 (a breast cancer cell line) cells were used as positive and negative control cells, respectively (Figure 9B). Experimental results verified that photoacoustic signal increased with increasing concentrations of melanin in cells. For MRI, T1-weighted images of MCF-7-TYR tumors displayed significantly higher signal compared with control tumors (Figure 9C). 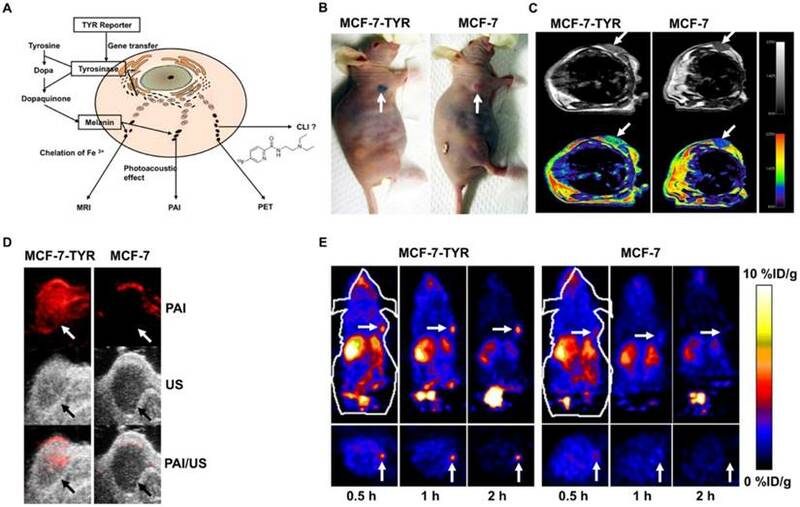 This TYR system enjoyed high sensitivity for both PAI and PET (Figure 9D-E); moreover, MCF-7-TYR tumors were clearly visualized with satisfactory tumor-to-background ratios at all time points, whereas for MCF-7 tumors, uptake was hardly detected (Figure 9E). MRI compensates for the low spatial resolution of PET and also features good contrast on T1-weighted images (Figure 9C). Our study successfully validated the feasibility of using a stand-alone reporter TYR for multimodality imaging and suggests the possibility of using a single reporter gene for multimodality molecular imaging . In another study , a novel TYR tracer, 18F-5-fluoro-N-(2-[diethylamino]ethyl)picolinamide (18F-5-FPN) was developed and tested. We demonstrated that transfected TYR can be accurately regulated by the Tet-on system and subsequently can induce the production of melanin. 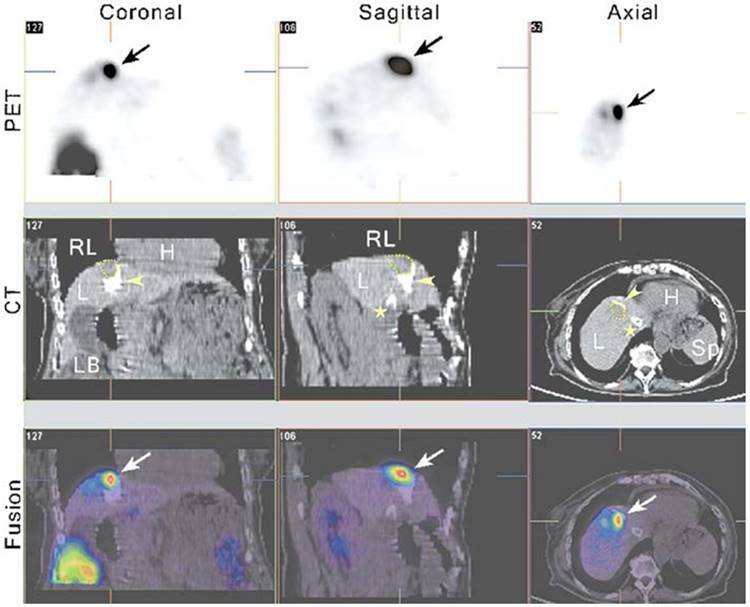 This positron probe showed specific targeted ability to melanin with favourable pharmacokinetics and high affinity in vitro PET, MRI and PAI study. The above experiment indicated that this TYR - 18F-5-FPN system has a great application prospect. This strategy combines reporter genes with contrast agents for multimodality imaging. It also allows visualization of cellular processes in individual cells and tissues by two or more modalities, more conveniently than pure fusion reporter genes. However, target cells cannot be tracked longitudinally via this strategy vs. single gene and fusion gene multimodality imaging systems, because the concentration of the contrast agents will decrease quickly with subsequent cell death and phagocytosis [13, 150, 168]. For example, in stem cell transplantation therapy, De Vocht et al. established a combined labeling strategy for bone marrow-derived stem cells based on physical labeling with blue fluorescent micron-sized iron oxide particles (GB MPIO) and genetic modification with the reporter genes luciferase and eGFP (BMSC-Luc/eGFP) for the purpose of unambiguously identify bone marrow-derived stem cell survival, localization, and differentiation following engraftment in the central nervous system of mice by using in vivo BLI/MRI . As compared with unlabeled bone marrow-derived stem cell-Luc/eGFP, the results demonstrated a significantly higher in vitro BLI signal intensity (ratio 1.4-1.5) from GB MPIO-labeled bone marrow-derived stem cell-Luc/eGFP. In addition, they concluded that the internalization of particles by cells is the necessary condition to increase the BLI signal in vitro. Moreover, both at weeks 1 and 2 post-implantation, the results showed a 2.9 ratio of in vivo BLI signal amplification due to GB MPIO labeling of bone marrow-derived stem cell-Luc/eGFP. Daadi et al. demonstrated that animals receiving human neural stem cell (hNSC) grafts (labeled with SPIO) showed less hyperintensity in stroke size on T2-weighted images ; also, the current evidence tends to suggest that SPIO does not alter the physiological properties of the NSCs either in vitro or in vivo [169-174]. Higuchi et al. retrovirally transduced the sodium iodide symporter (NIS) gene into human endothelial progenitor cells for reporter gene imaging with 124I-PET and labeled them with iron oxides for visualization on MRI . Owing to the dilution of MRI contrast agents, it can only offer cell biology information soon after transplantation. However, the signal intensity generated by the NIS reporter gene did not decrease with time, thus confirming that it is a good complement to MRI. Thus, versatile imaging of transplanted cells in vivo by this multimodality imaging strategy would offer comprehensive information about cell biology behavior and therapeutic effects. One expectation of reporter gene imaging is its straightforward translation from laboratory animal models to human clinical practice . The advantages of PET imaging make it a suitable modality for use in translational research . Recently, some clinical studies have incorporated nuclear-based reporter genes to monitor cancer gene therapy. Yaghoubi et al. reported a study to measure the pharmacokinetics, stability, and safety of 18F- FHBG in healthy volunteers. The results indicated that FHBG exhibited low background signal, rapid clearance, and biosafety suitable for applications in humans. Penuelas et al. [178, 179] demonstrated that 18F-FHBG PET may be used to monitor HSV1-tk gene expression in patients with hepatocellular carcinoma after intratumoral injection of recombinant adenovirus (AdCMVtk) (Figure 10). Transgene expression was detectable in all patients with doses > 1012 viral particles . These findings indicate that 18F-FHBG PET may be used to monitor viral vector-mediated transgene expression in clinical trials of cancer patients, and also could be a useful tool to predict the efficacy of gene-therapy strategies. Jacobs et al. demonstrated liposomal-mediated HSV1-tk gene delivery in five patients with recurrent glioblastoma. Specific 124I-FIAU uptake was only observed in one patient. This may be due to the relatively poor gene transduction efficiency of liposomes. In another study, Dempsey et al. attempted to image herpes simplex virus 1716 expression during oncolytic viral therapy in human malignant glioma. Regrettably, no increased 123I-FIAU accumulation was detected in any of the eight patients by SPECT imaging. The authors discussed the possible reasons for this result, including the impermeability and inconsistent disruption of the BBB, the use of weak promoters, and the short half-life of 123I. Moreover, these suicide genes can be regarded as reporter genes without showing significant defect if imaging is performed before treatment, and can be used to determine the best time point to initiate treatment. During treatment, due to the pharmacological competition from the therapy prodrugs, sometimes it may be difficult to image suicide gene expression with the same reporter gene . In addition to gene therapy, cell-mediated immunotherapy  or stem cells  can also be imaged via reporter genes. Yaghoubi et al. demonstrated the first clinical use of reporter gene-based cell therapy imaging in patients with glioma. This study showed higher 18F-FHBG signal at the site of HSV1-tk-transduced autologous cytolytic T lymphocytes. 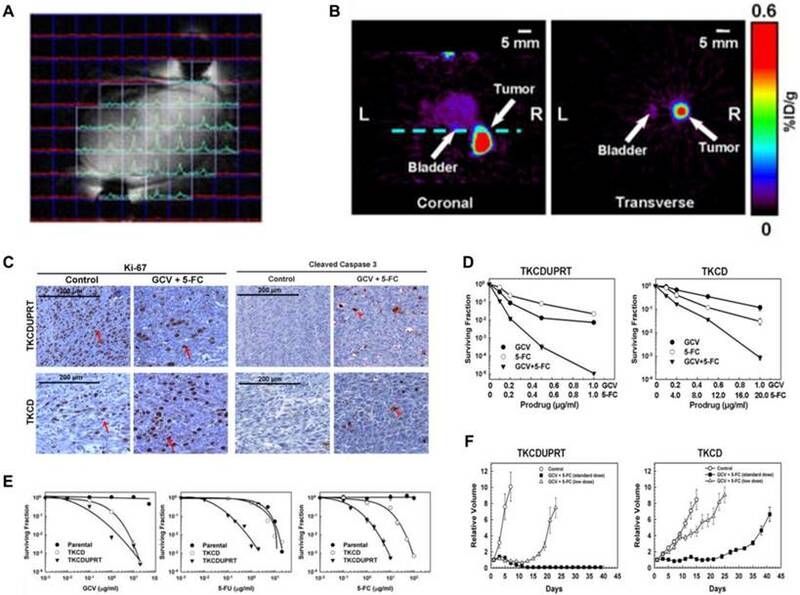 Although several studies have been performed in patients with brain tumors, the radiotracer-based molecular probes for the HSV1-tk enzyme barely penetrate the intact BBB , hence they may not be suitable to monitor the kinetics of therapeutic transgenes or stem cells targeted to the central nervous system . LeMay et al. showed that the vasodilatory bradykinin analog RMP-7 successfully enhanced the permeability of the BBB to ganciclovir. This study suggests it may be an important adjunctive treatment for suicide gene therapy and chemotherapeutic drug delivery to brain tumors. A limitation of non-human reporter genes like HSV1-tk and its mutants is their potential immunogenicity. One approach to reduce this risk is to use mammalian species reporter gene constructs [187, 189]. These include sodium iodide symporter (NIS) [176, 189-191], human norepinephrine transporter (hNET) [189, 192, 193], human type 2 somatostatin receptor (hSSTr2) [194, 195], dopamine type 2 receptor (D2R) [196, 197], recombinant carcinoembryonic antigen (CEA) , mutant deoxycytidine kinases , human mitochondrial thymidine kinase type 2 (hmtk2) [200, 201], anti-polyethylene glycol (anti-PEG) , and human estrogen receptor ligand binding domain (hERL) [203, 204]. However, the use of such endogenous human genes has two potential problems: first, the imaging probes can also accumulate in tissues that express the endogenous gene. Salivary glands, stomach and thyroid gland may obstacles for NIS-based imaging or treatment . Organs or tissues that express endogenous SSTrs may produce elevated background signal, reducing diagnostic efficiency . Second, in turn, these reporter genes would mimic the function of endogenous genes and thus interfere with the cells in which they are transduced. Moreover, whether these PET reporter genes are immunogenic or not it is still unknown. Lee et al. demonstrated that their sensitivity and selectivity of each in vivo imaging are not identical even if they all belong to human nucleoside kinase reporter systems, such as human deoxycytidine kinase, deoxycytidine kinase mutant (dCKDM), hTK2-N93D/L109F (TK2DM) and dCK-R104Q/D133N (dCKep16A). This study indicated the necessity for careful and rigorous verification in order to select the most suitable candidate for clinical study. Since MRI is already a widespread imaging technology used in clinical diagnosis and progression monitoring, the application of MRI reporter genes would greatly promote the development of translational medicine. Compared with genes used in optical imaging, MRI reporter genes, including Oatp1, Lysine Rich-protein (LRP), LacZ, and β-Galactosidase are more likely to be converted into clinical applications . However, they suffer from modest sensitivity, making them slightly inferior to genes used in nuclear imaging. In recent years, newer hybrid cross-platform PET/MRI technology has emerged. It combines the superb soft tissue characterization of MRI and the metabolic characterization of PET [207, 208]. Since the first whole body PET/MRI system was installed in 2010 , PET/MRI dual-imaging systems have been widely applied in clinical studies and trials of brain tumors [210, 211], head and neck carcinoma , breast diseases [208, 213], lymphoma , ovarian cancer , and prostate cancer . These encouraging results indicate a future direction for clinical applications of multimodality reporter genes. We have predicted a bright future for the use of reporter genes in clinical research. To date, no clinical studies using multimodality reporter genes have emerged. Several issues must be resolved to optimize the use of reporter genes in clinical protocols: (1) Is gene transduction or transfection successful? (2) Is the transduced or transfected gene distributed to the target organ (or tissue), and is it the best distribution? (3) Is the level of gene expression sufficient for imaging or treating the target organ or tissue? (4) What is the best time to quantify reporter gene expression? (5) How long does the reporter gene expression last in the target tissue? . The clinical application of reporter genes is still in its infancy, and there are still many aspects to be perfected. However, once we solve the abovementioned problems, the development and approval of a multimodality reporter gene-reporter probe system for human studies will progress. This reporter gene system can be applied in many different fields, and will play an important role in exploring human physiology and pathology . The use of imaging reporter genes has developed rapidly in the past few decades, and is being set to play a leading role in molecular imaging. The main applications such as tracking cells, monitoring gene therapy, imaging endogenous gene expression, visualization of specific biological process, imaging interaction between proteins, and drug screening have been widely used in preclinical and clinical studies [1, 8-10]. With the development of various imaging modalities, remarkable achievements are being made in monitoring metastasis , immune cell trafficking [103, 218], the biological behavior of transgenic mouse models [82, 142, 219], and stem cell therapy . Although numerous molecular and cellular behaviors can be demonstrated noninvasively and objectively in vivo, there are still many events that cannot be imaged by existing methodologies. Changes in intracellular pH, electrical impulses from nerve cells, and reactive oxygen species generation are some examples of molecular events that still require dedicated probes and advanced imaging approaches to be imaged in the condition of intact cells in vivo . The limitations of reporter genes include immunogenicity and gene mutation, uncertainty of timing of the reporter gene expression, the success rate of gene transduction or transfection, and probe targeting performance. Subsequent exploration and optimization research of reporter modality genes will concentrate on these limitations. Since multimodality reporter gene imaging integrates the strengths from two or more imaging modalities while minimizing their limitations, it can provide overall structural, functional, and molecular information to monitor complex biological processes both spatially and temporally and also offers the prospect of improved diagnostic and therapeutic monitoring abilities [4, 14]. Through continuous improvement in instrumentation, development of new reporter genes and probes, identification of novel targets, and advances in software tools, multimodality reporter gene imaging can become an indispensable tool for biomedical research. Au NP: Au nanoparticle; BBB: blood-brain barrier; BLI: bioluminescence imaging; BMDCs: bone marrow-derived dendritic cells; CLI: Cerenkov luminescence imaging; CT: computed tomography; CD: cytosine deaminase; DEX: dexamethasone; D2R: dopamine D2 receptor; DEN: diethylnitrosamine; eGFP: enhanced green fluorescent protein; ESC-ECs: embryonic stem cell-derived endothelial cells; 5-FC: 5-fluorocytosine; 18F-FDG: 18F-fluorodeoxyglucose; 18F-FHBG: 9-(4-18F-Fluoro-3-[hydroxymethyl]butyl)guanine; FIAU: 2-fluoro-2- deoxy-1-β-D-arabinofuranosyl-5-iodouracil; FLI: fluorescence imaging; Fluc: firefly luciferase; GB MPIO: blue fluorescent micron-sized iron oxide particles; GCV: ganciclovir; GDEPT: Gene-directed enzyme prodrug therapy; Gd-EOB-DTPA: gadolinium ethoxybenzyl-DTPA; GFP: green fluorescent protein; HCC: hepatocellular carcinoma; HSV1-tk: herpes simplex virus type-1; hFTH: human ferritin heavy chain; hNIS: human sodium-iodine symporter; IA: intra-arterial; IRES: internal ribosome entry site; LTRs: long terminal repeats; MPIO: Micron-sized particles of iron oxide; MRI: magnetic resonance imaging; myc-hFTH: myc-tagged human ferritin heavy chain; NIS: sodium-iodine symporters; NMI: nuclear medicine imaging; OI: optical imaging; PAI: photoacoustic imaging; PET: positron emission tomography; RFP: red fluorescent protein; RLuc: Renilla luciferase; SPECT: single photon emission computed tomography; SPIO: superparamagnetic iron oxide; TfR: transferrin receptors; TK: thymidine kinase; TYR: Tyrosinase; UPRT: uracil phosphoribosyltransferase; USPIO: ultrasmall superparamagnetic iron oxide particles. This work was supported by the National Natural Science Foundation of China (No. 81371626 and 81630049), and the Clinical Research Physician Program of Tongji Medical College, Huazhong University of Science and Technology (No. 5001530008). We thank Libby Cone, MD, MA, from Liwen Bianji, Edanz Group China (www.liwenbianji.cn/ac), for editing the English text of a draft of this manuscript.